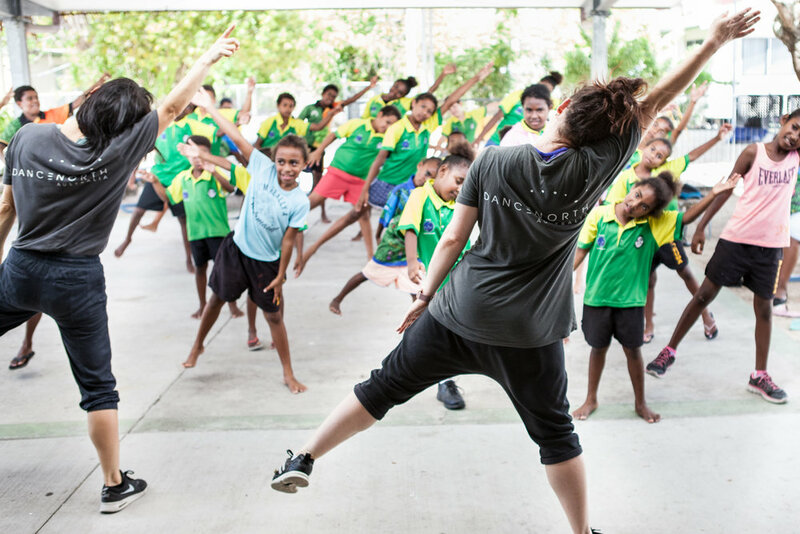 Dancenorth has recently embarked on an annual regional workshop tour, traveling to regional areas in Western Queensland, North Queensland and Poruma Island (Torres Strait) to deliver dance workshops to schools and community groups. This ambitious program honors an ongoing engagement with Poruma Island, revisits existing relationships and invites new connections, broadening our connection with communities in regional Queensland. As part of the first leg of the tour, Artistic Director Kyle Page and the Dancenorth Community and Enrichment team travelled to Poruma Island to explore, share and learn alongside the students of Ngurpay Lag Primary School and the Poruma Island Community. The team facilitated workshops that explored the Company repertoire, whilst encouraging creative thinking through contemporary dance techniques. “Our time on Poruma Island was incredible. It gave us the opportunity to reconnect with the community once again, who welcomed us back with open arms.” Says Dancenorth Education and Outreach Manager Susan van den Ham. “This is an outstanding program and boosts not only my student’s physical activity but their overall confidence and well-being. Thanks again Dancenorth, we look forward to seeing you next year.” Says Poruma Ngurpay Lag Head of Campus Deb Steele. As part of the second leg of the tour, Dancenorth’s Company dancers and the Community and Enrichment team will travel to regional areas including; Emerald, Cairns, Longreach, Winton, Hughenden and Barcaldine. The group will deliver innovative workshops within local schools, encouraging and exploring movement, while nurturing creativity in participants. The Dancenorth Education and Outreach team have recently returned from a wonderful week of cultural exchange on Poruma Island, working with the incredible students from Ngurpay Lag Primary School. Dancenorth are elated to have the opportunity to create positive social change by empowering the lives of people through art.